"The landscape of Albion Street was quite different when the Methodist Episcopal Church occupied a site on the street, east of the railroad tracks. 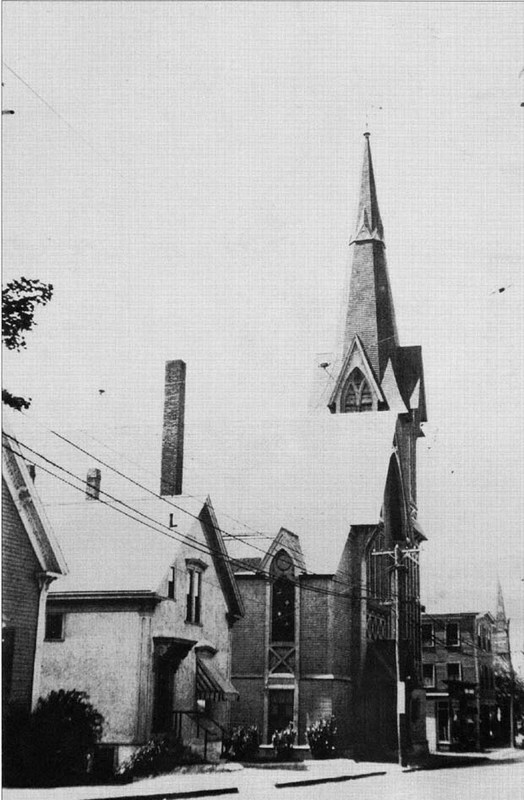 Organized on June 4, 1865 with a membership of 26, the congregation held services in the vestry of the Universalist Church on Main Street until the Albion Hall (at the corner of Albion and Foster Streets) was purchased in 1870. After three years of continued growth, a new site was purchased further west on Albion Street in 1873. The building was completed and dedicated in February of the following year at an expense of $25,000. According to published accounts, the church edifice occupied a 'prominent and central' position on Albion Street. From one corner rose a 'graceful spire 130 feet. A vestry provides room for the Sunday school and social meetings. It is the home of a prosperous and growing religious body, recognized in the community as earnest and aggressive in the support of moral and religious movements.' Other reports indicate that the vestry and kitchen were 'below stairs' and the building itself was of Swiss timber construction adapted to 14th Century Gothic outline. The steeple was struck by lightning three times: 1916, 1917 and again in 1926. During the Hurricane of September 21, 1938, the church's newly rebuilt chimney crashed through the roof's east corner and fell inside, damaging part of the auditorium and balcony. The estimated $3000 damage did enough harm to structurally weaken the building, resulting in the building being condemned and subsequently torn down by the Mystic Building Wrecking Co. on October 11, 1938. The church conducted an auction of bricks from the church chimney to finance the campaign for funds to rebuild the church." -- Text from calendar by Jayne M. D'Onofrio. “Methodist Church, Albion Street, 1927,” NOBLE Digital Heritage, accessed April 22, 2019, https://digitalheritage.noblenet.org/noble/items/show/7030.